From the point of technology and quality, SMT (Surface Mount Technology) assembler's full capabilities can be observed and found when you go through key elements in the SMT assembly process. After all, confronted with such a complicated process, it is almost impossible to inspect each manufacturing detail and it’ll be risky to be fully aware of your CM’s capabilities just from end products. Therefore, this article will share sufficient knowledge in evaluating SMT quality of a PCB assembler, which allows you to test whether your circuit boards assembled in that factory conform to your required standard. Key elements in evaluating SMT assembly quality include solder paste printing quality, reflow quality, component placement, how to avoid manual placement, capabilities on stencil thickness calculation and modification, size of aperture, up-to-data equipment or instrument. Among these elements, quality control of solder paste printing is the most important one. If solder paste is badly printed, your circuit boards will incontrovertibly suffer from low quality even though components mounting is accurately completed and reflow temperature is appropriately modified. After all, non-standard amount of printed solder paste is closely associated with quality of soldering. When it comes to other elements to evaluate SMT assembler’s capabilities, accuracy of surface mounter is usually fixed and reflow temperature curves adjustment is closely related with engineer’s knowledge and manufacturing experience. Few special modifications are needed now that the harm occurred by solder paste melting temperature and too much heat brought to material is fully understood. Then come the methods to evaluate and ensure compatibility of solder paste printing quality. Solder paste printing mainly comes in two aspects of capabilities: solder paste quality administration capability and solder paste printing capability. High-quality solder paste relies on its brand and freshness degree. For the freshness degree of solder paste, it has to be tracked starting from the time of warming up, jar opening and stirring. Different manufacturers conform to different regulations stipulating that solder paste has to be used up within a certain period of time because otherwise, it'll get oxidized, leading to insufficient soldering in the process of reflow soldering. Furthermore, significant administration has to be implemented on solder paste applied on stencil. Solder paste is recommended to be stored in low-temperature storage to maintain its activity, and warming up (generally takes 4+ hours) is required prior to its application to prevent its temperature from being incompatible with room temperature. When temperature varies dramatically, water drop will be generated on the surface of solder paste so that splashing will be caused during the process of high-temperature reflow soldering. In addition, you should also investigate on issues like how the solder paste applied in stencil will be processed, how solder paste is timed and how to administer and control solder paste that has been applied in original stencil when stencil is modified. Another item needs to be carefully studied is the time when first batch of solder past is warmed up, especially for PCB (Printed Circuit Board) Assemblers who don't run 24 hours a day. As SMT line starts working only when solder paste is completely warmed up, some manufacturing houses will run the warming up 4 hours earlier or even one day earlier to save time and improve efficiency of SMT lines. It's necessary to know that solder paste's activity will be greatly decreased if the warming up procedure took place one day before application. Actually in practice, professional PCB Assemblers will surely scrap the solder paste if the warming up does happen over 12 hours before its application. In terms of solder paste printing capability inspection, PCBs containing fine pitch (0.4mm or 0.5mm) BGA should be selected for inspection. Repeating solder paste printing should be implemented on the same piece of PCB for five to ten times and each time of printing result should be inspected under microscope to see whether issues like bridging or displacement occurs. For SMT manufacturer owning SPI (Solder Paste Inspector), it can be applied to measure solder paste amount (volume). Furthermore, stencil cleaning is also one element affecting the quality of solder paste printing. As solder paste leakage tends to be caused by long-term printing, accounting for bridging, stencil should be cleaned with non-dust cloth after intervals of time or with ultrasonic wave to avoid hole blocking issue. Solder paste is mainly composed by tin powder (metal alloy powder including Sn, Ag, Cu, Bi) and flux whose volume ratios account for 50% respectively. It's necessary to select a type of suitable solder paste compatible with requirement of your products. Furthermore, tin powder can be rated with different numbers. The larger the number is, the smaller the particle is. Generally, No. 3 tin powder is used for SMT while No. 4 tin powder is applied for fine pitch or small soldering pad mounting. Steel is usually applied as material for stencil owing to its merits of being free from collapse and strong intensity force. Apertures of steel are generated generally based on three leading different methods: etching, laser cutting and electrotyping with different fees. In terms of products with fine pitch IC, laser cut stencil is suggested since aperture wall through laser cutting is more straight and neat. In spite of excellent performance of electrotyping stencils, they have limited effect and the price is relatively high. Stencil thickness and size of aperture greatly influence solder paste printing quality and reflow soldering quality. According to principles, the key administration point lies in tin volume in that amount of solder paste has to be compatible with final required soldering amount. In theory, the smaller SMD component is, the thicker stencil has to be. However, keep in mind that the thinner the solder paste is, the more difficult tin amount will be controlled. Basically, the thickness of an ordinary stencil is within the range from 0.12mm to 0.15mm. When it comes to fine pitch components (0201 or 01005), stencil with thickness of 0.1mm below is needed. A slight modification of scraping blade pressure leads to tremendous changes on solder paste printing. If blade pressure is too low, solder paste will fail to fall at the bottom of stencil aperture and to be effectively transferred to pad. If blade pressure is too high, solder paste will be too thin or stencils will be even damaged. The optimal situation is that solder paste is scrapped from the surface of stencil totally. Printing thickness largely relies on the thickness of stencil. A slight modification of solder paste printing thickness can be obtained through blade speed modification and blade pressure. Suitable reduction of printing speed of blade also leads to solder paste amount increasing on PCB. In the process of solder paste printing, stencil should be cleaned the moment every 10 pieces of PCBs have been successfully printed in order to eliminate deposit at the bottom of stencils and pervasive solder paste. Generally alcohol without water is applied as cleaning agent. To obtain genuinely high SMT manufacturing quality, investigation and analysis have to be carried out on each manufacturing link and key elements so that effective control methods can be captured. Among the leading links in the SMT assembly process, solder paste printing is the most important. 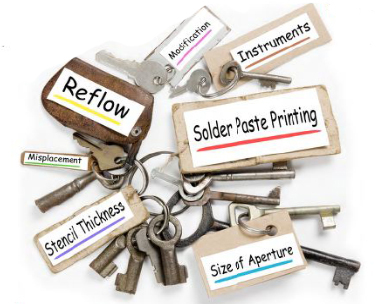 As long as reasonable parameters are set and corresponding laws between them are mastered, high-quality solder paste printing can be achieved at last. PCBCart has been providing full turnkey PCB Assembly services for worldwide companies for more than ten years. We have the capabilities to apply SMT technology into circuit board assembly process. Feel free to submit quote request for your PCB assembly project by clicking the following button. The quote will be sent to you within 1-2 working days. Article wrote by Dora Yang, engineer from PCBCart, originally posted on SMT Magazine 2017 March issue.